Yokohama WTS was an important race for me. After a huge disappointment in Gold Coast a month earlier I wanted to turn it around and perform to the level I knew I was capable of. I was excited to race – training had been going really well for the past month and I knew I was in good form. When called down onto the start pontoon on the water’s edge I headed to the far left. When the starter’s horn blew and we hit the water the all the girls on the left half quickly separated into small groups. I wasn’t sure if sticking with the group I was with was a good decision and when we got to the first buoy I had to turn quite wide and was probably around halfway position-wise. I realised starting on the left might not have been the best position but I stuck with it and before I knew it I was swimming forward through people. I came through the first lap (halfway) in 26th place and in the second lap I again felt like I was advancing through the field. Nearing the end of the 1500m I knew I was close to the front but I wasn’t sure how close till I exited the water. There were only a handful of people ahead of me! I exited t2 in 4th position (which was a nice change compared to my last race!). I rode quite hard in the first few laps of the ride as I knew we had a little gap to a big group behind us. Within a few laps the major groups had all come together with the bulk of the field. From there I focused on trying to hold good wheels and stay out of trouble. Heading into t2 I managed to move up close to the front. As I racked my bike I threw one of my used gels into my ‘box’ in transition. Just before I left I noticed it had popped out. Leaving anything in transition outside your box can result in a 15 second penalty so I decided it wasn’t worth the risk and went back to put it back in, losing a few seconds and heading into the run leg towards the back of the big group…but still better off than losing 15 seconds later in the run. My focus on the run was to make sure I paced it well so I did my best not to panic and took the first lap fairly conservatively. Heading into the second lap (of 4) I had run myself back into the top 10 and just off the back of a small group ahead. I made the decision to put in a surge and run across the gap to them as quickly as possible. I made contact with them within 1km and shortly after the pace picked up and people started dropping off. 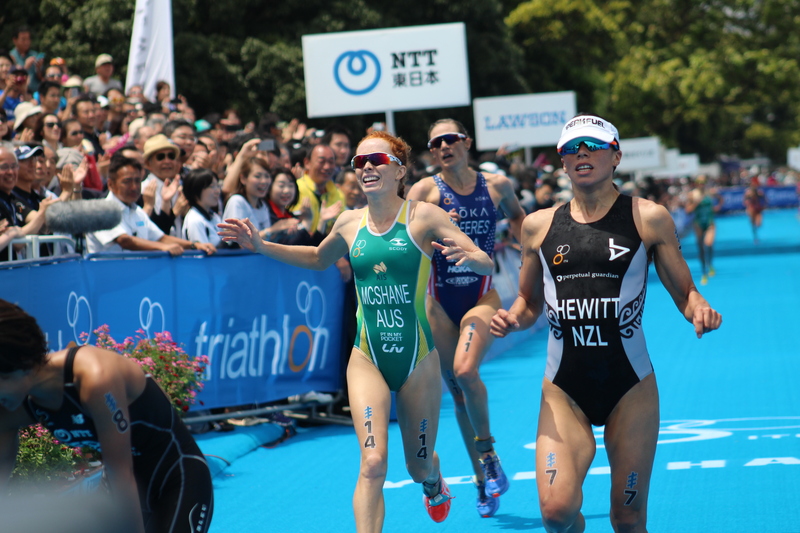 With around 4km to go Ashleigh Gentle, Ai Ueda and Andrew Hewitt accelerated and opened up a gap (My training partner and eventual winner Gwen Jorgensen was already up the road and out of sight!) and I ended up in the middle on my own. I saw Andrea start to drop off so I decided to surge again and run up to her. We ran together for the remainder of the race and ended up in a sprint finish which she pipped me in the last few metres. I crossed the line 5th which is my best World Series result to date! More importantly, I am super happy with every decision I made under pressure during the race and how I backed myself even facing the small setbacks – something I’ve struggled with in the past. A huge congratulations to the podium girls Gwen Jorgensen, Ash Gentle and Ai Ueda. After Gold Coast I did doubt a lot but I was fortunate to have the support of my family and my coach JT to ensure that I mved on quickly – as there really was no time to dwell on results between the two races. I’ve also been fortunate to have spent the past 12 weeks training twice a week at the New South Wales Institute of Sport in the heat lab. Thank you to Katie Slattery, Ned Brophy – Williams and Annette Eastwood who have facilitated this. I’ve now touched down in Vitoria-Gasteiz (my European base) where I will begin preparing for the next part of the season.